Cube and its dual Octahedron exist in any multi-dimensional space; as shapes, they compose multi-shell clusters of octahedral symmetry (resulted by operations on maps) and crystal networks. A particular attention was given to clusters decorated with octahedra and dodecahedra, respectively. Cube is the only Platonic solid that can tessellate the 3D space. This chapter was focused on two space fillers: the cube C and the rhombic dodecahedron, Rh12 (i.e. d(mC).14, or dual of cuboctahedron) and to their networks, derived by map operations, like dual, medial, truncation or leapfrog. The clusters and networks were characterized by figure count, ring signature and centrality index. 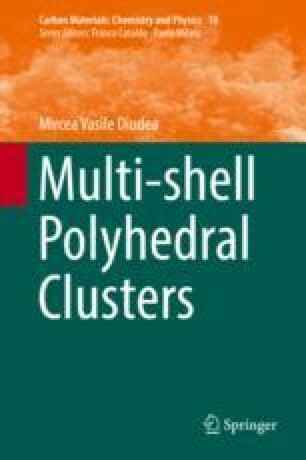 An atlas section illustrates the discussed multi-shell polyhedral clusters and triple periodic structures, respectively.